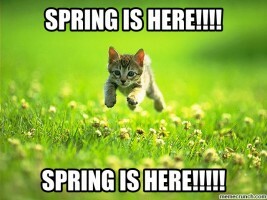 It's been a long winter, but the sun is finally shining, the birds are singing, and the city is waking up! Looking for some fun things to do before you bury your head in your textbooks for finals week? 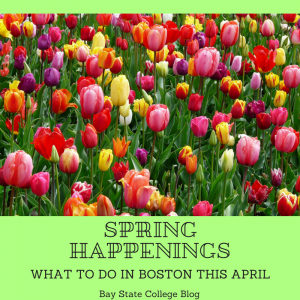 Check out what's going on in Boston this April. One of the most anticipated events of the year, The Office of Student Involvement & Leadership invites you to join them once again for a day at Six Flags New England! Sign up with Kristin Staine for bus transportation and tickets to the park for the entire day. Celebrate Patriot's Day in the best way you can by supporting all the participants in the 122nd annual Boston Marathon! If you feel like traveling, there are a few locations with clear visibility and little crowding (read more here) but if not, you could always wander over to the finish line on Boylston Street, just steps from our campus! Enjoy an evening of art, culture and inspiration every first Friday of the month. It's a great chance to shop small, find some new dining spots, and enjoy the latest works exhibited in SoWa's finest galleries. Nothing is better than a free concert to get your mind off your upcoming finals week. Head over to Tsai Performance Center on Commonwealth Ave. for a music soirée put on by the Astronomy Department at BU! Mark your calendars for one of the most interesting and intriguing events you'll ever experience! Explore all that ArtWeek has to offer all around the Greater Boston Area. See how artists in a variety of fields work from behind the scenes, and since most functions are either affordable or completely free, you can hit up as many as you want without breaking the bank. Who teaches my evening classes?